Daniel Kind, an Oxford history don, and his girlfriend Miranda, a "lifestyle" journalist, decide to leave the rat-race and escape to an idyllic cottage in the Lake District. As well as being tired by a diet of university politics and teaching, Daniel is recovering from the death of his previous girlfriend, Aimee (we are not told how she died until near the end of the book). He has met Miranda only recently, and is both pleased and slightly worried by her impulsive enthusiasm for starting a new life in the remote Tarn Cottage. The young couple are soon living in their new home, surrounded by builders and meeting a series of locals - the publican, a local dealer in antiquarian books and the lord of the manor with his beautiful wife. It soon emerges that Daniel has strong links with the region: he stayed in a room in the pub on family holidays when a boy, and his father Ben was a senior policeman in the local force. Ben abandoned his family for another woman when Daniel was about eleven. Although his father is now dead, Daniel is keen to meet the "other woman" and to find out all he can about the man, as his mother and sister had refused any further contact after the split. The previous owner of Tarn Cottage was an old woman called Mrs Gilpin. Some years ago, a young woman was murdered and her body found on the "sacrifice stone" on the coffin road (an ancient trail used to carry corpses to church for burial) at the back of the valley. Mrs Gilpin's 'simple' son Barrie was also found dead near the girl’s body, so the police investigation, led by Daniel's father Ben, concluded that Barrie was the murderer - a result that the locals are only too keen to endorse. Daniel, who knew the dead boy from his childhood holidays, is less sure, and ruffles feathers, not least Miranda's, by his questioning of the locals about the old case. Matters might have ended there but for the fact that the delightfully named DCI Hannah Scarlett is put in charge of a new police team to investigate cold cases, a current fashion in the light of developments in forensic science unavailable to contemporary investigations. Hannah is particularly interested in the Barrie Gilpin case, as she had been Ben Kind's junior partner, and is aware that the older man was troubled about this particular case. When the case is formally re-opened, simmering old tensions boil over, both among the local suspects and among the relationships of the police, not least Hannah herself. 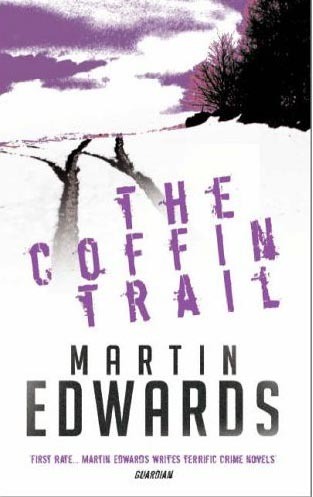 THE COFFIN TRAIL an absorbing read, full of local detail and vignettes of Lake District life. Hannah and Daniel are plausible characters, and if the hints here are carried forward, they are surely destined to become more closely involved with each other in future books. The central mystery is satisfyingly resolved, with a clever twist in the tale.